The Codelocks CL500 Stainless Steel PK Coded Front Plate Only - Use With Panic Hardware is a coded front plate only with an extended length spindle in order to be compatible with the majority single point panic pads. The existing lock that is being used with this product must either have a 22mm fixing hole before the spindle, or two horizontal holes on either side of the spindle (38mm centres). The CL500 locks are supplied with a random code commencing with the "C" clear button. To change the code after fitting, the lock must first be removed from the door. The code is non sequential, that is the code can be entered in any order e.g. 1234 can be 4321 or 1342 or whatever is the most convenient sequence. With the 13 buttons a total of 8,191 different codes are available, any of which may be entered in any order. The heavy duty mechanical codelocks feature full size lever handles, allowing use as the primary lock on most doors especially in high traffic situtations. But the Codelocks CL500 Front Plates can be used with existing mortice latch or locks rather than taking the whole mechanism off when replacing. 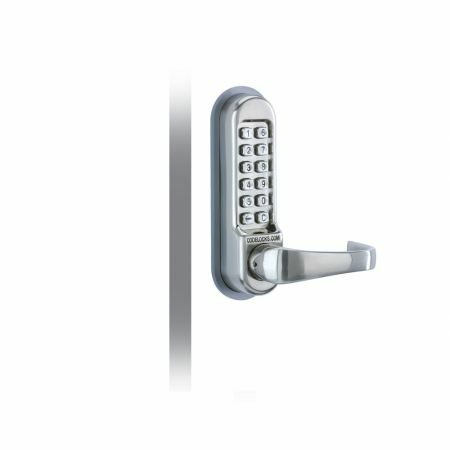 Provides security and is easy to set up. Contained everything for fitting including tweezers for code change.